Blade construction: Katana of Shinogi-zukuri, Iori-mune. Kasane is very thick, shallow curve with less degree of tapering from base to the medium Chu-Kissaki. In particular, the Kasane of tip is rather on thicker side so that entire katana is almost mint original condition and massively heavy on both hands. The entire blade is created in heroic style with full of Samurai spirits. Forging(Hada): Forging is fine Ko-Itame-hada with indication of flowing Masame along temper line. Temper (Hamon): Hamon starts with straight Suguha then passage of undulating Gunome in regular alignment in a bit on tighter side sparkling Nioi granules. In the interior of temper, there works with Noi mist-like crystalline area. Temper of tip (Boshi): Boshi forms irregular undulating wide Gunome then large circles. Tang (Nakago): Nakago is in unsigned UBU original. One peg hole. Ō-sujikai (greatly slanting left) filemarks with Horizontal decorative Keshō. 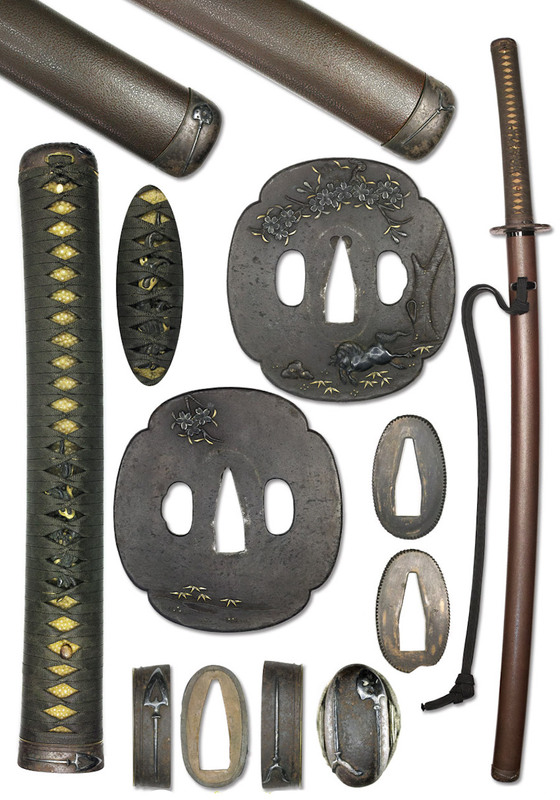 Here is a proud Samurai sword with an original Koshirae mount in almost mint condition from late Edo period. It is recently found from an ancient family since Edo period then judged as a work of JUMYO 寿命. Just being set into a new Shirasaya mount and Koshirae is set with Tsunagi for display. JUMYO sword makers served themselves at the service of Owari Tokugawa clan in 5 generations. 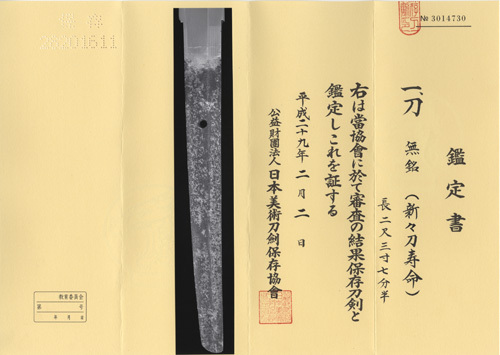 It is assumed that this katana would be made as an article for presentation to an honored Samurai since pronouncing JUMYO is an auspicious happy sign as long life and has been prized for charm and divine protection. An original Brown stone surface lacquered scabbard Uchikatana Koshirae consists of : Metal fittings of Fuchi/Kashira, Kojiri : Arrowhead design, Iron ground, silver inlay, unsigned Tsuba : Fine horse/Sakura tree design, Iron ground Takabori Inlay, unsigned Menuki : Dragon design, Shakudo Yobori, Iroe Tsuka : White rayskin, black Moro-tsumami-maki style lozenge wrap This katana is an almost mint original condition as a matter of course there appears very slight darkish rust and insignificent scratch marks and there is a chip off at Hamachi underneath Habaki. Those wares will be entirely removed by next skilled polish. An original copper Habaki, preserved in a new Shirasaya plain wood mounting. Old polish/Condition scale: very good (using a scale of mint-excellent-very good-good-fair-poor).